O6-Benzylguanine (6-BG) inactivates mammalian O6-methylguanine DNA methyltransferase (MGMT), an important DNA repair protein that protects cells against chloroethylnitrosourea (CENU) cytotoxicity. 6-BG is being tested as an approach to treat CENU-resistant tumors that overexpress endogenous MGMT. However, in addition to restoring CENU tumor cell sensitivity, 6-BG also increases the cytotoxic effects of CENUs on hematopoietic cells. Several 6-BG-resistant human MGMT mutants have been characterized in Escherichia coli and are predicted to protect mammalian cells against the combination of 6-BG and CENU treatment in vivo. Two mutants, P140A and P140A/G156A, demonstrated 20- and 1200-fold more resistance to 6-BG depletion of MGMT activity compared with wild-type MGMT (WTMGMT). Here, we analyzed retroviral vectors that express either WTMGMT, the P140A or P140A/G156A mutant forms of MGMT. Retroviral-infected L1210 hematopoietic cells demonstrated similar levels of RNA in all transduced clones. However, the amount of MGMT protein and DNA repair activity was reduced in clones expressing the P140A/G156A mutant compared with those expressing WTMGMT or P140A. Expression of P140A was associated with a 4- to 8-fold increase in resistance to 6-BG depletion of MGMT in transduced L1210 clones and a 1,3-bis(2-chloroethyl)-1-nitrosourea IC50 of 50 μM (compared with 27.5 μM for WTMGMT) in primary murine hematopoietic cells. These results demonstrate the utility of screening 6-BG-resistant MGMT proteins in hematopoietic cells and provide evidence that the P140A mutant form of MGMT generates 6-BG- and CENU-resistant hematopoietic cells. Retrovirus vectors expressing this mutant may be useful in future human gene therapy trials. O6-Methylguanine DNA methyltransferase (MGMT) directly repairs DNA damage at theO6-position of guanine generated by chemotherapeutic agents such as the chloroethylnitrosoureas (CENUs;Pegg et al., 1995). Left unrepaired, these adducts rearrange and lead to the formation of interstrand DNA cross-links, which are cytotoxic because they disrupt DNA replication (Toorchen and Topel, 1983). MGMT repairs the O6-adduct before the formation of a DNA cross-link by transferring the alkyl group to a cysteine residue located within the acceptor site of the protein. Removal of the O6-alkyl lesion protects against CENU-induced cytotoxicity (Pegg et al., 1995). Because this reaction is stoichiometric, the cellular level of MGMT correlates with CENU resistance. Several preclinical studies have demonstrated CENU-resistant blood cells after increasing the expression of MGMT in the bone marrow (BM) via gene transfer. Retroviral-mediated expression of MGMT protects both murine and human BM cells against CENU-induced cytotoxicity (Allay et al., 1995, 1997; Moritz et al., 1995; Jelinek et al., 1996; Maze et al., 1996, 1997; Reese et al., 1996; Davis et al., 1997). Our laboratory has demonstrated that transduction of murine hematopoietic stem cells with a retroviral vector encoding the human MGMT cDNA protects progenitor cells in vitro and long-term repopulating myeloid and lymphoid cells in vivo against 1,3-bis(2-chloroethyl)-1-nitrosourea (BCNU)-induced cytotoxicity (Moritz et al., 1995; Maze et al., 1996). Many primary tumors have demonstrated an increase in MGMT and CENU resistance compared with corresponding normal tissue (Preuss et al., 1996; Silber et al., 1998). MGMT can be rapidly depleted by 6-BG, which irreversibly binds to MGMT via the formation ofS-benzylcysteine (Dolan et al., 1990a,b). Once benzylated, MGMT is degraded (Pegg et al., 1991). Several preclinical studies have demonstrated that 6-BG can restore CENU tumor cell sensitivity in vitro and in a variety of human tumor xenografts in vivo by depleting tumor cell MGMT activity (Futscher et al., 1989; Dolan et al., 1990a,b, 1991; Mitchell et al., 1992; Gerson et al., 1993; Marathi et al., 1994; Phillips et al., 1997). As a result, 6-BG is currently being tested in clinical trials (Koc et al., 1996). Because hematopoietic cells express low levels of endogenous MGMT protein, the addition of 6-BG could further potentiate the degree of CENU-induced myelosuppression observed in vivo (Gerson et al., 1985;Gerson et al., 1986; Moritz et al., 1995; Reese et al., 1996). Several MGMT mutants have previously been generated, by site-directed and random mutagenesis techniques, and have been shown to confer resistance to 6-BG (Crone et al., 1994; Loktionova and Pegg, 1996; Encell et al., 1998; Xu-Welliver et al., 1998). Crone et al. (1994) demonstrated that two mutants, one containing an amino acid substitution of alanine for proline at position 140 (P140A) and another containing an amino acid substitution of alanine for glycine at position 156 (G156A), were 20- and 240-fold more resistant to 6-BG inactivation of MGMT compared with wild-type MGMT (WTMGMT). In addition, a double mutant containing both the P140A and G156A mutations (P140A/G156A) conferred 1200-fold more resistance to 6-BG compared with WTMGMT (Crone et al., 1994).Loktionova and Pegg (1996) further demonstrated that expression of either P140A or G156A protected Chinese hamster ovary cells against 6-BG sensitization to BCNU in vitro. Similarly, Hickson et al. (1996)observed that expression of P140A/G156A protected hamster fibroblast cells against 6-BG and mitozolomide treatment in vitro, while noting that the P140A/G156A protein demonstrated a 10-fold decrease in repair activity in these cells. More recently, investigators have demonstrated that retroviral expression of G156A in hematopoietic cells was associated with a 2-fold shift in the BCNU IC50 for human (Reese et al., 1996) and a 5-fold shift for mouse BM cells (Davis et al., 1997) in vitro after 10 μM 6-BG treatment. Expression of G156A was also noted to result in less protein and repair activity compared with WTMGMT (Reese et al., 1996). This study, along with the observations noted above, raises questions about the stability and activity of MGMT mutants expressed in hematopoietic cells. Therefore, we focused our analysis on the P140A and P140A/G156A mutants, because the stability of these mutants has never been reported in hematopoietic cells. Our results clearly demonstrate that retroviral-mediated expression of the P140A mutant form of MGMT via a retroviral vector leads to a stable protein that protects hematopoietic cells against 6-BG and BCNU treatment and demonstrates a potential approach to increase the therapeutic index for the treatment of CENU-resistant tumors. Construction of Retroviral Vectors and Producer Cells. 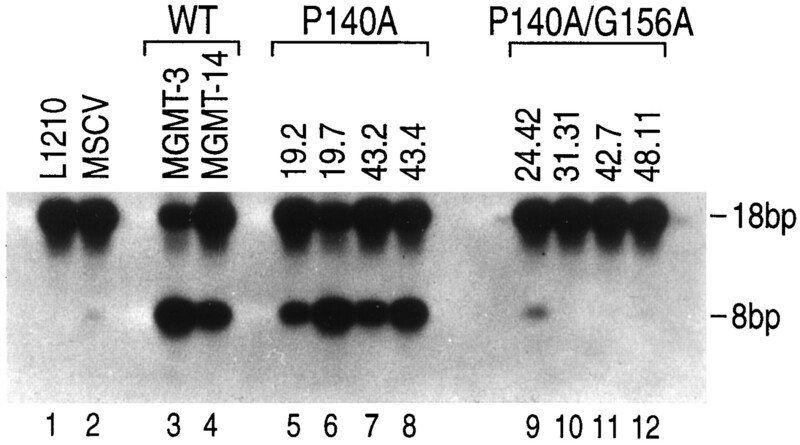 Moloney stem cell virus (MSCV2.1) retroviral vectors were constructed to express the cDNA sequence for either WTMGMT, MGMTP140A (P140A), or MGMTP140A/G156A (P140A/G156A) (Fig.1). DNA sequences were amplified from pINAGT (Crone et al., 1994) expression plasmids containing the respective cDNAs by polymerase chain reaction. Briefly, a 5′-oligonucleotide sequence (GGCCGCGAATTCATGGACAAGGATTGTGAAATG) containing an EcoRI restriction site and a 3′-oligonucleotide (CCGCTCGAGTCAGTTTCGGCCAGCAGGCGGGGA) containing anXhoI restriction site were used to amplify the 623-base pair human MGMT cDNAs. The amplified products were purified with a Qiaex II gel extraction kit (Qiagen Inc., Chatsworth, CA), cut withEcoRI and XhoI, and cloned intoEcoRI-XhoI restriction sites of MSCV2.1. Positive clones were identified by diagnostic restriction analysis and sequenced to confirm both the presence of the desired mutation and the lack of other mutations that may have arisen during polymerase chain reaction. Retroviral producer lines were generated for each construct by transfecting plasmid DNA into GP+envAm12 (Markowitz et al., 1988a) withN-[1-(2,3-dioleoyloxy)propyl]-N,N,N-trimethylammonium methylsulfate, according to the manufacturer’s recommendation (Boehringer Mannheim, Indianapolis, IN). Transient virus, harvested 24 to 36 h after transfection, was used to infect GP + E-86 cells (Markowitz et al., 1988b) in the presence of 8 μg/ml Polybrene (Aldrich Chemical Co., Milwaukee, WI). GP + E-86 cells, split 1:40 in a six-well plate, were infected once every 24 h for 5 days with fresh virus and replated in limiting dilution in the presence of 0.75 mg/ml G418 (dry powder; GIBCO-BRL, Gaithersburg, MD). After 10 to 12 days of culture, G418-resistant clones were individually picked and expanded. Clones were screened both for viral titer by standard methods (Hanenberg et al., 1996), and for MGMT repair activity as described below (performed on G418-resistant NIH/3T3 populations). Retroviral producers used to infect L1210 cells (WT; clone 2, P140A; clones 19, 21, 43, and 62, P140A/G156A; clones 24, 31, 42, 48) were identified and had titers 9 × 102 to 6 × 104 G418r colony-forming units (CFU)/ml. High titer producer clones (61.19 and 33.5) used to infect primary murine BM cells were generated by ping-pong with GP + envAm12 and had titers of >1 × 105 (Moritz et al., 1995). All producer lines were maintained in Dulbecco’s modified Eagle’s medium (GIBCO-BRL) supplemented with 10% calf serum (Summit Biotechnology, Ft. Collins, CO), 2% (v/v) penicillin-streptomycin (GIBCO-BRL). Schematic diagram of WT, P140A, and P140A/G156A retroviral vectors constructed in MSCV2.1. Relevant restriction sites are noted. Proviral size is 3.4 kb. Expression of the MGMT cDNA is via the 5′-LTR (arrow). MSCV2.1 contains a neomycin (neo)-selectable marker cloned under the control of the phosphoglycerate kinase (Pgk) promoter. Retroviral Transduction of Cell Lines and Primary BM. L1210 cells (American Type Culture Collection, Rockville, MD) were maintained in 1630 RPMI supplemented with 15% calf serum (Summit Biotechnology), 2% penicillin-streptomycin, and 1% glutamine (GIBCO-BRL). L1210 cells were infected by incubating 1.5 × 106 cells with 2 ml of filtered virus supernatant overnight at 37°C on plates precoated with 8 μg/cm2 of fibronectin (FN) fragment CH296 (RetroNectin; Takara Shuzo, Biotechnology Group, Otsu, Japan). G418-resistant L1210 clones were generated after infection by plating 1 × 103 cells/ml in 0.6% agar (Difco Bacto-agar; Difco Laboratories, Detroit, MI) in the presence of 1 mg/ml G418 for 7 days at 37°C. Individual G418-resistant L1210 colonies were harvested with a drawn Pasteur pipette with an inverted microscope, transferred to 96-well plates, and amplified for additional analysis. No mock-transduced cells survived G418 concentrations greater than 0.75 mg/ml after 7 days. B16 melanoma and Lewis lung (LL) carcinoma cells (American Type Culture Collection), maintained in Dulbecco’s modified Eagle’s medium (GIBCO-BRL) supplemented with 10% calf serum (Summit Biotechnology) and 2% penicillin-streptomycin (GIBCO-BRL), were infected in the presence of 8 μg/ml Polybrene (Aldrich Chemical Co, Milwaukee, WI) without FN CH296. Twenty-four hours after infection, cells were washed in PBS (GIBCO-BRL), trypsinized at 37°C, and plated in media supplemented with 1 mg/ml G418 (dry powder; GIBCO-BRL) for 7 days at 37°C. Primary murine BM cells were transduced in the presence of FN CH296. Briefly, BM was harvested from the hind limbs of 8- to 10-week-old female C57BL/6J mice (The Jackson Laboratory, Bar Harbor, ME) 48 h after i.p. injection with 5-fluorouracil (150 mg/kg b.wt. ; SoloPak Laboratories, Franklin Park, IL). These cells were prestimulated for 48 h at 37°C in 5% CO2 with 100 U/ml recombinant human interleukin-6 (Pepro Tech Inc., Rock Hill, NJ), and 100 ng/ml recombinant rat stem cell factor (Amgen, Thousand Oaks, CA) in α-modified Eagle’s medium (GIBCO-BRL), supplemented with 20% fetal calf serum (Summit Biotechnology). Prestimulated BM cells were transduced by incubating 5 × 106 cells with 2 ml of filtered virus supernatant overnight at 37°C on plates precoated with 8 μg/cm2 FN CH296, as previously described (Hanenberg et al., 1996). Analysis of MGMT Expression and Protein. Expression of retroviral vector-derived MGMT was determined by Northern and Western blot analysis and an O6-guanine repair assay. RNA was isolated and purified from infected and G418-selected L1210 clones with TriPure isolation reagent (Boehringer Mannheim) and resuspended in diethylpyrocarbonate (Sigma, St. Louis, MO)-treated water. Six micrograms of total RNA was electrophoresed through a 0.9% agarose gel containing 6% formaldehyde and 1× 3-(N-morpholino)propanesulfonic acid. RNA was subsequently transferred to nitrocellulose filters, hybridized to a32P-end-labeled EcoRI-XhoI WTMGMT cDNA fragment derived from MSCV2.1WTMGMT, and exposed to X-ray film at −70°C. Filters were probed with a32P-end-labeled actin probe to ensure equivalent loading of RNA. 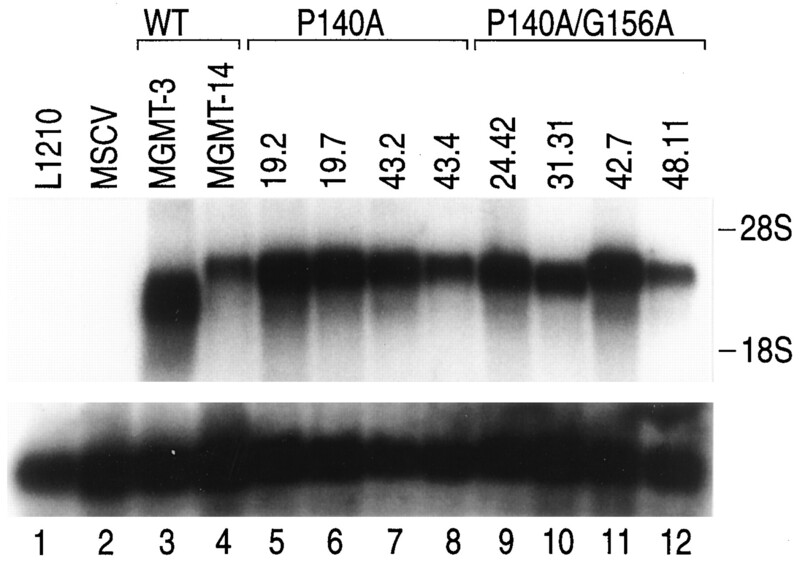 Western blots were performed with MT3.1 monoclonal antibody (Chemicon International Inc., Temecula, CA), which recognizes human WTMGMT protein. Infected and G418-resistant L1210 clones were harvested, washed with PBS, and centrifuged; and the pellet was resuspended and denatured in 2× protein loading dye. Total cellular protein was quantitated using Bio-Rad Protein Assay (Bio-Rad Laboratories, Hercules, CA) and 20 μg of protein was electrophoresed through a 12% SDS polyacrylamide gel, transferred to nitrocellulose (Nitro ME MSI, Westboro, MA) and incubated in a 5 ml volume of a 1:200 dilution of MT3.1 monoclonal antibody overnight at 4°C. The presence of MT3.1 antibody was detected by chemiluminescence (Amersham, Little Chalfont, Buckinghamshire, England). MGMT protein activity was determined, as previously described (Wu et al., 1987), with a custom-synthesized radiolabeled 18-base pair oligonucleotide containing anO6-methylguanine base within a methylation-sensitive PvuII restriction site. Cells (1.5 × 106) were centrifuged, washed once in PBS, and resuspended in 400 μl of fresh assay buffer (50 mM Tris, pH 8.0, 1 mM dithiothreitol, 1 mM EDTA, and 5% glycerol). After sonicating each sample on ice (five bursts of 5 s duration), total cellular protein was quantitated with a Bio-Rad protein assay (Bio-Rad Laboratories). Cellular extract containing 25 μg of total protein from each L1210 clone was incubated at 37°C for 2 h with 0.2 pmol of the 32P-end-labeled 18 base-pair oligonucleotide in 150 μl of assay buffer. After incubation, the DNA substrate from this reaction was extracted with phenol/chloroform, precipitated with ethanol, centrifuged in a 1.5-ml Microfuge tube (12,000 rpm, 30 min), and air dried. DNA was resuspended in 17 μl of dH2O and incubated for 1 h at 37°C in the presence of 10 U of PvuII (Boehringer Mannheim) in salt solution according to the manufacturer’s instructions. The reactions were terminated by adding 9 μl of 95% formamide dye (containing 0.1% bromophenol blue and 80% xylene cyanol). After a 5-min incubation at 95°C, the samples were briefly cooled on ice and electrophoresed through a 20% denaturing polyacrylamide, 6 M urea sequencing gel at 26 mA, 50°C for 1 h.
6-BG Inactivation of MGMT Activity and BCNU Treatment. Resistance of expressed MGMT protein to 6-BG was determined in L1210 clones by incubating 5 × 106 cells with 0, 5, 10, 20, or 40 μM 6-BG (kindly provided by Dr. R Moschel, Frederick Cancer Research Center, Frederick, MD) for 1 h at 37°C and assaying each sample for residual MGMTO6-methylguanine DNA repair activity. Resistance to 6-BG depletion of MGMT was also determined by incubating 2 × 105 L1210 cells or 1 × 106 transduced primary murine BM cells with 20 μM 6-BG for 1 h at 37°C, followed by subsequent exposure of treated cells to 0, 25, 50, or 75 μM BCNU (Drug Synthesis and Chemistry Branch, Developmental Therapeutics Program, Division of Cancer Treatment, National Cancer Institute, Bethesda, MD) for 1 h at 37°C. Treated L1210 cells were centrifuged, washed twice with media, resuspended, and plated in agar as described above. Treated primary murine BM cells were centrifuged, washed two times with media, and resuspended; and 5 × 104 cells/ml were plated in a 0.6% agar supplemented with 100 ng/ml recombinant rat stem cell factor and 50 ng/ml recombinant murine granulocyte, monocyte-colony stimulating factor. Cultures were incubated at 37°C in a humidified environment at 5% O2 and 10% CO2 for 7 days. BCNU survival was determined by dividing the number of colonies surviving 6-BG and BCNU treatment at each dose by the number of colonies scored in untreated plates and multiplying by 100. Retroviral-Mediated Expression of 6-BG-Resistant MGMT Mutants. Expression of 6-BG-resistant MGMT mutants was determined in individual clones of L1210 cells, a murine hematopoietic cell line, after transduction with either WTMGMT, P140A or P140A/G156A vectors (Fig. 1). L1210 cells were used as targets for retroviral transduction because they lack endogenous MGMT and are extremely sensitive to BCNU treatment. 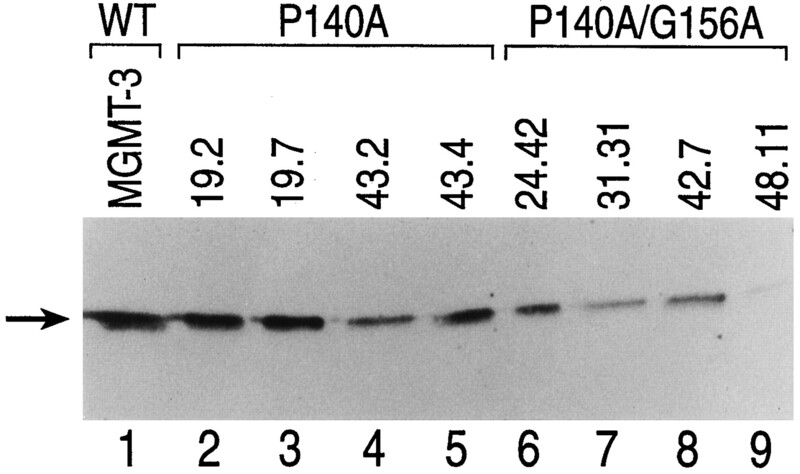 Northern blot analysis of total cellular RNA isolated from a WTMGMT-transduced clone (clone 14; lanes 4), four P140A-transduced clones (19.2, 19.7, 43.2, and 43.4; lanes 5–8), and four P140A/G156A-transduced clones (clones 24.42, 31.31, 42.7, and 48.11; lanes 9–12) demonstrated similar levels of viral MGMT RNA transcripts of the expected 3.4-kb size (Fig. 2). WTMGMT-transduced clone 3 also demonstrated similar levels of RNA compared with the other clones (clone 3; lane 3). However, a smaller transcript was observed. RNA transcripts will vary in size because the MSCV vector contains a splice donor and an acceptor site 3′ of the 5′-long terminal repeat (LTR), which allows for alternatively spliced RNA species (Hawley et al. 1994). No MGMT-hybridizing RNA bands were noted in uninfected L1210 (Fig. 2, lane 1) or in G418-resistant L1210 cells infected with an empty MSCV2.1 virus (1 × 106 G418r CFU/ml titer on NIH/3T3 cells) used as a control (Fig. 2, lane 2). The same blot was reprobed with actin to demonstrate similar RNA loading (Fig. 2, lanes 1–12, lower panel). Northern blot analysis of MGMT transgene expression in L1210 clones. Six micrograms of total RNA was loaded, electrophoresed, blotted, and probed as described in Materials and Methods. Labeling above each lane represents clone numbers. Lane 1, uninfected L1210 cells; lane 2, L1210 cells infected with an empty MSCV2.1 virus; lanes 3 and 4, WT clones 3 and 14, lanes 5–8, P140A clones 19.2, 19.7, 43.2, and 43.4; lanes 9–12, P140A/G156A clones 24.42, 31.31, 42.7, and 48.11. The lower panel shows the same blot probed with actin to demonstrate equivalent RNA levels in each lane. Protein Content and Activity of 6-BG-Resistant MGMT Mutants. To examine the content of MGMT protein in infected and G418-resistant L1210 cells, we analyzed L1210 clones by immunoblotting with a monoclonal antibody that recognizes the 21-kDa human MGMT (MT3.1) (Fig.3). Similar levels of human MGMT protein were detected in clones expressing either WTMGMT (Fig. 3, lane 1) or P140A (Fig. 3, lanes 2–5). However, the amount of P140A/G156A protein was reduced in P140A/G156A-transduced L1210 clones compared with WTMGMT and P140A (Fig. 3, lanes 6–9). Densitometric analysis of the ratio of MGMT protein with an endogenous protein, equally present in every lane, demonstrated a ratio of 1.9 for WTMGMT-3 and 1.3 ± 0.26 for P140A-transduced L1210 clones. In contrast, these same ratios were 0.55 ± 0.10 for L1210 clones expressing the P140A/G156A protein. In addition, MGMT protein activity was analyzed with anO6-methylguanine DNA repair activity assay as previously described (Wu et al., 1987). As shown in Fig.4, MGMT protein activity was low or absent in P140A/G156A-transduced L1210 clones (Fig. 4, lanes 9–12) compared with cells infected with WTMGMT (lanes 3 and 4) or P140A (lanes 5–8). 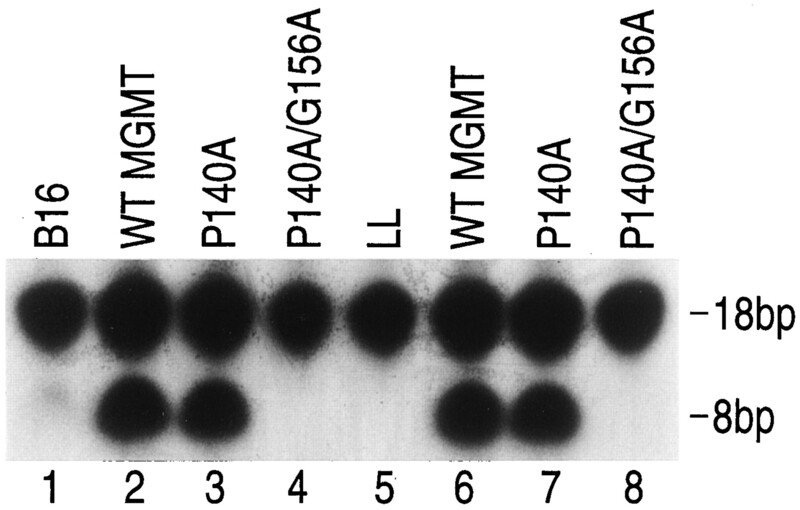 Little to no P140A/G156AO6-methylguanine DNA repair activity was observed in cell extracts from any of the P140A/G156A-transduced clones, even after assaying 20-fold more protein (data not shown). In contrast, L1210 clones expressing the P140A single mutant demonstrated levels of repair activity to similar to those of WTMGMT-transduced clones. As expected, neither L1210 nor L1210 cells infected with an empty MSCV2.1 vector demonstrated any detectableO6-methylguanine DNA repair activity (Fig. 3, lanes 1 and 2). Western blot analysis of MGMT protein in L1210 clones. Twenty micrograms of total protein was loaded in each lane, electrophoresed, and subjected to Western blot analysis. Arrow, the 21-kDa MGMT protein. Labeling above each lane represents clone numbers. Lane 1, WT clone 3; lanes 2–5, P140A clones 19.2, 19.7, 43.2, and 43.4l lanes 6–9, P140A/G156A clones 24.42, 31.31, 42.7, and 48.11. O6-methylguanine DNA repair activity in L1210 clones. Repair activity was assayed by the conversion of the 18-bp band to the 8-bp band. The level of activity correlates with the ratio of these bands. Labeling above each lane represents clone numbers. Lanes 3 and 4, WT clones 3 and 14; lanes 5−8, P140A clones 19.2, 19.7, 43.2, and 43.4; lanes 9–12, P140A/G156A clones 24.42, 31.31, 42.7, and 48.11. Uninfected L1210 (lane 1) and L1210 cells infected with an empty MSCV2.1 virus (lane 2) were used as negative controls. Activity of the P140A/G156A Mutant Form of MGMT in Other Mammalian Cells. To determine whether the reduced amount of P140A/G156A protein and O6-methylguanine DNA repair activity in L1210 clones was specific for hematopoietic cells, B16 melanoma and LL carcinoma cells, which also lack endogenous MGMT activity, were infected with retroviral supernatant, selected in G418, and analyzed for MGMT repair activity. Consistent with the results observed in L1210 cells, noO6-methylguanine DNA repair activity was detectable in either P140A/G156A-transduced B16 or LL cells (Fig.5, lanes 4 and 8). In contrast, P140A-transduced B16 and LL cells (Fig. 5, lanes 3 and 7) demonstrated levels of repair activity similar to those of WTMGMT-transduced cells (Fig. 5, lanes 2 and 6). O6-Methylguanine DNA repair activity in cell lines. B16 melanoma (B16) (lanes 1–4) and Lewis Lung (LL) cells (lanes 5 and 6) were infected and selected in G418 as described in Material and Methods, and analyzed for repair activity. Lane 1, uninfected B16 cells; lane 2, WT-transduced B16 cells; lane 3, P140A-transduced B16 cells; lane 4, P140A/G156A-transduced B16 cells; lane 5, uninfected LL cells; lane 6, MSCV2.1 WTMGMT-transduced LL cells; lane 7, P140A-transduced LL cells; lane 8, P140A/G156A-transduced LL cells. P140A-Transduced L1210 Clones and Primary Murine BM Cells Are Resistant to 6-BG Depletion and BCNU Treatment. To examine the resistance of P140A-transduced L1210 cells to 6-BG inactivation of MGMT, we analyzed the level of MGMT repair activity with and without pretreatment with 6-BG. 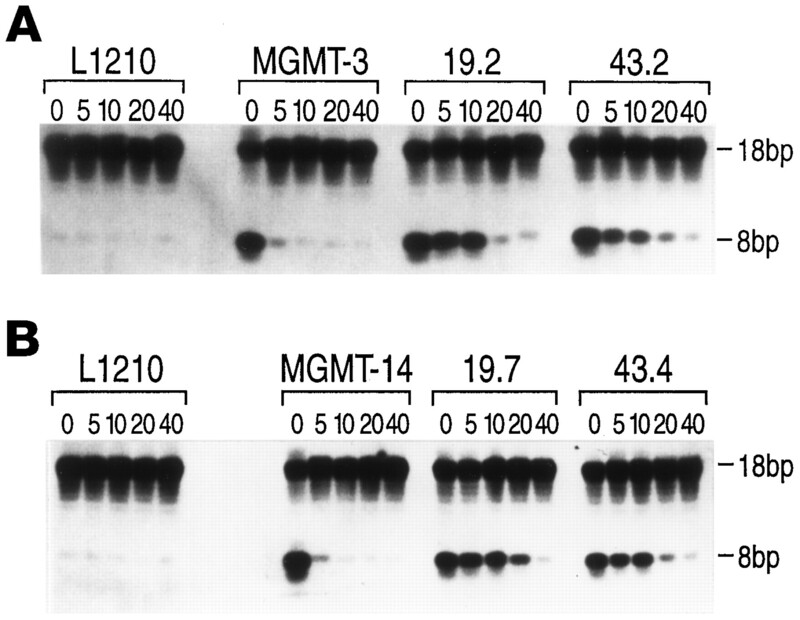 In these experiments, L1210 cells transduced with either WTMGMT or P140A were exposed to 5 to 40 μM 6-BG for 1 h. Figure 6 shows that two separate clones of L1210 cells transduced with WTMGMT (clone 3, Fig.6A, and clone 14, Fig. 6B) could be depleted of MGMT repair activity in a dose-dependent fashion. A demonstratable reduction in repair activity (i.e., the lack of appearance of the 8-base pair band) was observed after exposure to 5 μM 6-BG. No repair activity was apparent after exposure to 10 μM or higher concentrations of 6-BG (Fig. 6, A and B). In contrast, all four L1210 clones (19.2, 43.2, 19.7, and 43.4) transduced with P140A that were analyzed maintained MGMT repair activity even at 20 to 40 μM 6-BG (Fig. 6, A and B). We next analyzed the ability of retroviral-mediated P140A MGMT expression in these cells to protect against 6-BG sensitization to BCNU. After treatment with 20 μM 6-BG, cells were exposed to increasing concentrations of BCNU, and survival was determined by using a clonogenic assay. All four of the P140A-transduced L1210 clones tested (Fig.7B) were significantly more resistant to the combination of 6-BG and BCNU than clones expressing either WTMGMT (Fig. 7A) or P140A/G156A (data not shown). The IC50 for BCNU in P140A-transduced L1210 clones (Fig. 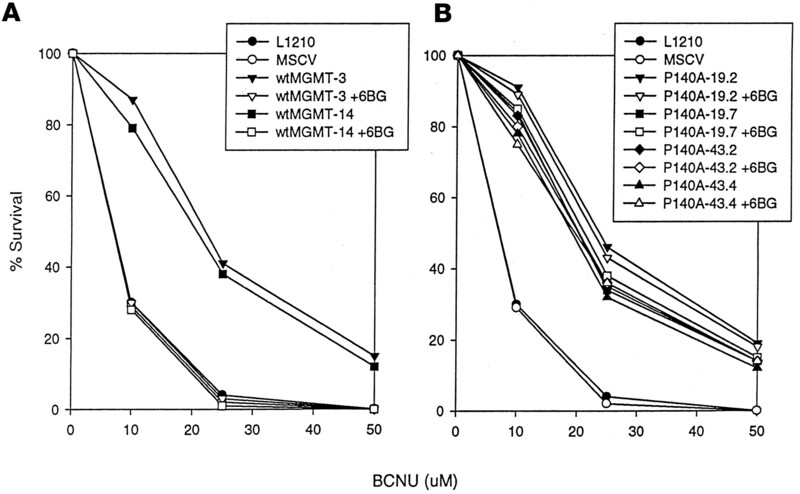 7B) averaged 21.2 μM after 6-BG treatment compared with 7.5 μM for WTMGMT-transduced L1210 clones (Fig. 7A), and these mutants continued to show resistance even after treatment with 50 μM BCNU. Similar to transduced L1210 cells, primary murine hematopoietic cells expressing the P140A mutant form of MGMT were significantly more resistant (p < .05) to 6-BG inactivation of MGMT and sensitization to BCNU than mock- or WTMGMT-transduced cells (Table1). Table 1 shows both the percentage survival for murine CFU-granulocyte macrophage (CFU-GM) and the IC50 for BCNU derived from mock-, WTMGMT-, or P140A-transduced BM with and without 6-BG pretreatment. WTMGMT-transduced CFU-GM demonstrated only 20% survival and an IC50 for BCNU of 27.5 μM after treatment with 20 μM 6-BG and 40 μM BCNU. In contrast, P140A-transduced CFU-GM demonstrated 77.0% survival and an IC50 for BCNU of 50.0 μM. 6-BG depletion ofO6-methylguanine DNA repair activity in L1210 clones. L1210 cells infected with either WT (clone 3) or P140A (clones 19.2 and 43.2) shown in A, were treated with 5, 10, 20, or 40 μM 6-BG as described in Material and Methods and analyzed for MGMT repair activity. B shows L1210 cells infected with either WT (clone 14) or P140A (clones 19.7 and 43.4) which were treated in a similar manner. Labeling above each lane represents clone number and 6-BG concentration. Retroviral-mediated expression of P140A protects L1210 clones in vitro against 6-BG and BCNU treatment. L1210 cells were infected with either WT (clones 3 and 4) or P140A (clones 19.2, 19.7, 43.2, and 43.4) or empty retrovirus (MSCV) and analyzed for 6-BG inactivation of MGMT and BCNU resistance in vitro. The data are plotted as percentage survival versus BCNU dose and represent the averages from three independent experiments. CENUs are commonly used alkylating agents with moderate activity in brain tumor therapies. CENUs are cytotoxic to both hematopoietic stem and progenitor cells, and intensive use of these agents in humans leads to cumulative bone marrow toxicity, delayed myelosuppression, pancytopenia, and immune suppression (Schabel, 1976; Botnick et al., 1978; Neben et al., 1993; Kay et al., 1995; Maze et al., 1997). Our laboratory and other investigators have previously demonstrated the ability to generate blood cells resistant to CENUs by using retroviral-mediated gene therapy. Transduction of both murine and human hematopoietic cells with a retroviral vector encoding the human MGMT cDNA protects BM cells in vitro and in vivo against BCNU-induced cytotoxicity (Moritz et al., 1995; Allay et al., 1996, 1997; Jelinek et al., 1996; Maze et al., 1996, 1997; Davis et al., 1997). We previously reported that mice reconstituted with WTMGMT-transduced stem cells demonstrated significantly high survival after a myelosuppressive regimen of five weekly doses of 40 mg/kg BCNU as compared with control transplanted animals. High levels of MGMT activity have been demonstrated in multiple human tumors and cell lines (Pegg et al., 1995; Dolan and Pegg, 1997). 6-BG, which binds to and inactivates MGMT, has been shown to deplete tumor cell MGMT repair activity and to sensitize human tumors to CENU treatment both in vitro and in vivo (Futscher et al., 1989; Dolan et al., 1990a,b, 1991; Mitchell et al., 1992; Gerson et al., 1993; Marathi et al., 1994; Phillips et al., 1997). In this regard, we have recently demonstrated that continuous exposure to 6-BG results in a more prolonged inactivation of xenograft tumor MGMT repair activity in vivo compared with bolus 6-BG infusions (C. Kurpad, unpublished observations). Such prolonged inactivation of MGMT may be a critical component of tumor cell kill in vivo, because regeneration of repair activity would likely lead to reacquisition of the resistance phenotype. Genetic approaches to expressing a 6-BG-resistant form of MGMT in hematopoietic cells provide a unique way to protect blood cells in vivo from CENU toxicity in the setting of pharmacological manipulation of primary resistant tumors. 6-BG will potentiate CENU-induced hematopoietic cytotoxicity in vivo (Gerson et al., 1996;Davis et al., 1997). Harris et al. (1995) have analyzed retroviral-mediated expression of ada, the bacterial homolog of MGMT, in murine hematopoietic cells. Compared with mammalian MGMT, this particular homolog is naturally resistant to 6-BG due to differences in the primary and secondary structure surrounding the adduct-binding site (Goodtzova et al., 1997). Retroviral expression ofada in murine hematopoietic cells after gene transfer was associated with only modest protection against 6-BG and BCNU treatment in vivo (Harris et al., 1995). Concerns regarding the expression ofada in mammalian cells, such as nuclear targeting and its ability to possibly evoke an immune response in vivo, have prompted our laboratory and others to pursue the use of 6-BG-resistant human MGMT mutants. Crone et al. (1994) previously studied the ability to generate 6-BG-resistant human MGMT protein inO6-guanine repair-deficient bacterial cells by introducing specific amino acid substitutions around the active site that mimic ada. Several mutations provided significant resistance against 6-BG inactivation of MGMT. Cells expressing single mutations P140A or G156A were shown to be >20- and 240-fold more resistant to inactivation by 6-BG compared with WTMGMT. In addition, the expression of a double mutant form of MGMT containing both the P140A and G156A mutations (P140A/G156A) demonstrated 1200-fold more resistance to 6-BG. In this report, we demonstrated that retroviral-mediated expression of P140A/G156A in transduced L1210 clones did not protect against the combination of 6-BG and BCNU. Molecular analysis of these clones demonstrated that, despite having similar levels of MGMT RNA compared with transduced L1210 cells expressing WTMGMT or the P140A mutant, P140A/G156A-transduced L1210 clones expressed less protein and little to no O6-methylguanine DNA repair activity. Hickson et al. (1996) have previously demonstrated that P140A/G156A protected cells against 6-BG inactivation of MGMT and sensitization to mitozolomide. Interestingly, they also observed a greater than 10-fold decrease in P140A/G156A repair activity compared with WTMGMT protein in both bacterial and Chinese hamster lung fibroblast cells. The ability of P140A/G156A to protect bacterial and Chinese hamster lung fibroblast cells, despite the reduction in repair activity and stability, may be due in part to the level of expression, because in these studies P140A/G156A was expressed via the human cytomegalovirus promoter, which has very strong transcriptional activity in cell lines compared with an MSCV2.1 5′-LTR promoter. Our results extend these observations to hematopoietic cells, where expression via a variety of viral promoters has been problematic. Taken together with the data previously reported, our data suggest that the P140A/G156A double mutant may be unstable in mammalian cells. Thus, this instability may be a major impediment to its use in modulating resistance to 6-BG in hematopoietic cells in vivo. We have also demonstrated that retroviral-mediated expression of the P140A mutant form of MGMT in L1210 clones leads to similar RNA, protein, and O6-methylguanine DNA repair activity levels compared with WTMGMT. Expression of P140A resulted in a 4-fold increase in resistance to 6-BG depletion ofO6-methylguanine DNA repair activity, which correlated with protection against the combination of 6-BG and BCNU in vitro. As shown in Fig. 7, L1210 clones demonstrated a 2.7-fold increase in the IC50 value for BCNU after 6-BG treatment, compared with WTMGMT. The expression and activity of P140A in L1210 clones were consistent with its activity in other mammalian cell types, such as B16 melanoma, LL cells (Fig. 5), and Chinese hamster ovary cells (Loktionova and Pegg, 1996). In addition, we report that gene transfer of P140A into primary murine hematopoietic progenitor cells protected against 6-BG depletion of MGMT and BCNU treatment. Expression of P140A correlated with a BCNU IC50 of 48 μM, after treatment with 20 μM 6-BG. As shown in Table 1, we observed greater than 70% survival of murine hematopoietic progenitor cells after treatment with 20 μM 6-BG and 40 μM BCNU. These results are similar to results obtained with the G156A MGMT mutant by Davis et al. (1997), who reported a 50% clonogenic survival with 25 μM 6-BG and 40 μM BCNU after gene transfer into murine hematopoietic cells. Although, the increase in 6-BG resistance (compared with WTMGMT) is statistically significant, the level of this resistance will need to be examined in vivo to determine whether it is sufficient to prevent depletion of activity after pharmacological manipulation with 6-BG. These experiments are currently under way in our laboratory in a mouse model. These results demonstrate that retroviral-mediated expression of the 6-BG-resistant P140A mutant form of MGMT in hematopoietic cells protects against in vitro 6-BG depletion of MGMT and sensitization to BCNU. We are currently testing the ability of P140A to protect murine hematopoietic cells against 6-BG and BCNU in vivo after gene transfer. In addition, Pegg and coworkers (Xu-Welliver et al., 1998) have recently demonstrated that other amino acid substitutions at position 140, such as P140K, confer significantly greater resistance to 6-BG compared with mutations P140A, G156A, or P140A/G156A. The median inhibitory dose (ID50) for 6-BG against these 6-BG-resistant mutant forms of MGMT varies from 60 to 300 μM, as opposed to 0.25 μM for WTMGMT (Dolan et al., 1990a,b). These doses are well above the concentrations required to achieve in vivo biochemical modulation of MGMT expressed in human tumor cell xenografts. If more resistance to 6-BG is necessary, mutants such as P140K, which is more than 100 times more resistant than P140A, may be more logical to pursue than double mutants, which are likely to give problems with expression level and poor activity due to lack of stability or mis-folding. These mutants may also be of importance with respect to the possible use of MGMT as a dominant selectable gene. We have previously reported that mice transplanted with MGMT-transduced hematopoietic stem cells demonstrated an enrichment of transduced cells in the lymphoid compartment after multiple doses of 40 mg/kg BCNU in vivo (Maze et al., 1997). Likewise, Allay et al. (1997), using WTMGMT, and Davis et al. (1997), using G156A, have observed an enrichment of transduced cells in the myeloid compartment in vivo after gene transfer of MGMT and BCNU treatment. Thus, MGMT may potentially be used to enrich for hematopoietic stem cells transduced with a retroviral vector containing a second nonselectable therapeutic gene, such as β-globin, in a nonablative setting, as suggested by Davis et al. (1997). Expression of a significantly greater 6-BG-resistant human MGMT mutant, such as P140K, may prove to be more advantageous in minimizing the BCNU dose necessary for enrichment after 6-BG treatment, thus reducing any possible BCNU-related systemic toxicity. In summary, this report demonstrates that retroviral-mediated expression of P140A protects hematopoietic cells against cytotoxic doses of BCNU after 6-BG depletion and provides an approach to protect blood cells whereas treating CENU-resistant tumors. ↵1 This work was supported by National Cancer Institute Grants PO1CA75426 (to D.A.W.) and CA45628–10 (to L.C.E.). (1997) Human alkyltransferase-transduced murine myeloid progenitors are enriched in vivo by BCNU treatment of transplanted mice. Exp Hematol 25:1069–1076. (1995) Retroviral transduction and expression of the human alkyltransferase cDNA provides nitrosourea resistance to hematopoietic cells. Blood 85:3342–3351. (1996) Retroviral-mediated gene transduction of human alkyltransferase complementary DNA confers nitrosourea resistance to human hematopoietic progenitors. Clin Cancer Res 2:1353–1359. (1978) Multisystem stem cell failure after apparent recovery from alkylating agents. Cancer Res 38:1942–1947. (1994) Mutations in human O6-alkylguanine-DNA alkyltransferase imparting resistance to O6-benzylguanine. Cancer Res 54:6221–6227. (1997) Selection for G156A O6-methylguanine DNA methyltransferase gene-transduced hematopoietic progenitors and protection from lethality in mice treated with O6-benzylguanine and 1,3-bis(2-chloroethyl)-1-nitrosourea. Cancer Res 57:5093–5099. (1990a) Modulation of mammalian O6-alkylguanine-DNA alkyltransferase in vivo by O6-benzylguanine and its effect on the sensitivity of a human glioma tumor to 1-(2-chloroethyl)-3-(4-methylcyclohexyl)-1-nitrosourea. Cancer Commun 2:371–377. (1991) Effect of O6-benzylguanine analogues on sensitivity of human tumor cells to the cytotoxic effects of alkylating agents. Cancer Res 51:3367–3372. (1990b) Depletion of mammalian O6-alkylguanine-DNA alkyltransferase activity by O6-benzylguanine provides a means to evaluate the role of this protein in protection against carcinogenic and therapeutic alkylating agents. Proc Natl Acad Sci USA 87:5368–5372. (1997) O6-Benzylguanine and its role in chemotherapy. Clin Cancer Res 3:837–847. (1998) Engineering human DNA alkyltransferases for gene therapy using random sequence mutagenesis. Cancer Res 58:1013–1020. (1989) Inhibition of a specific DNA repair system and nitrosourea cytotoxicity in resistant human cancer cells. Cancer Commun 1:65–73. (1985) O6-Alkylguanine-DNA alkyltransferase activity in human myeloid cells. J Clin Invest 76:2106–2114. (1996) Human CD34+ hematopoietic progenitors have low cytokine-unresponsive O6-alkylguanine-DNA alkyltransferase and are sensitive to O6-benzylguanine plus BCNU. Blood 88:1649–1655. (1986) Comparison of O6-alkylguanine-DNA alkyltransferase activity based on cellular DNA content in human, rat and mouse tissues. Carcinogenesis 7:745–749. (1993) Synergistic efficacy of O6-benzylguanine and 1,3-bis(2-chloroethyl)-1-nitrosourea (BCNU) in a human colon cancer xenograft completely resistant to BCNU alone. Biochem Pharmacol 45:483. (1997) Repair of O-6-benzylguanine by the Escherichia coli ada and ogt and the human O6-alkylguanine-DNA alkyltransferases. J Biol Chem 272:8332–8339. (1996) Colocalization of retrovirus and target cells on specific fibronectin fragments increases genetic transduction of mammalian cells. Nat Med 2:876–882. (1995) Retroviral transfer of a bacterial alkyltransferase gene into murine bone marrow protects against chloroethylnitrosourea cytotoxicity. Clin Cancer Res 1:1359–1368. (1996) Protection of mammalian cells against chloroethylating agent toxicity by an O6-benzylguanine-resistant mutant of human O6-alkylguanine-DNA alkyltransferase. Gene Ther 3:868–877. (1996) Long-term protection of hematopoiesis against the cytotoxic effects of multiple doses of nitrosourea by retrovirus-mediated expression of human O6-alkylguanine-DNA-alkyltransferase. Blood 87:1957–1961. (1995) Sequential phenotyping of myeloma patients on chemotherapy: Persistence of activated T-cells and natural killer cells. Leuk Lymphoma 16:351–354. (1996) Transfer of drug resistance genes into hematopoietic progenitors to improve chemotherapy tolerance. Semin Oncol 23:46–65. (1996) Point mutations in human O6-alkylguanine-DNA alkyltransferase prevent the sensitization by O6-benzylguanine to killing by N,N′-bis(2-chloroethyl)-N-nitrosourea. Cancer Res 56:1578–1583. (1994) Anti-neoplastic activity of sequenced administration of O6-benzylguanine, streptozotocin, and 1,3-bis(2-chloroethyl)-1-nitrosourea in vitro and in vivo. Biochem Pharmacol 48:2127–2134. (1988a) Construction and use of a safe and efficient amphotropic packaging cell line. J Virol 167:400–406. (1988b) A safe packaging line for gene transfer: Separating viral genes on two different plasmids. J Virol 62:1120–1124. (1996) Increasing DNA repair methyltransferase levels via bone marrow stem cell transduction rescues mice from the toxic effects of 1,3-bis(2-chloroethyl)-1-nitrosourea, a chemotherapeutic alkylating agent. Proc Natl Acad Sci USA 93:206–210. (1997) Reversal of 1,3-bis(2-chlorethyl)-1-nitrosourea-induced severe immunodeficiency by transduction of murine long-lived hematopoietic progenitor cells using O6-methylguanine DNA methyltransferase complementary DNA. J Immunol 158:1006–1013. (1992) Effect of O6-benzylguanine on the sensitivity of human tumor xenografts to 1,3-bis(2-chloroethyl)-1-nitrosourea and on DNA interstrand cross-link formation. Cancer Res 52:1171–1175. (1995) Retroviral-mediated expression of a DNA repair protein in bone marrow protects hematopoietic cells from nitrosourea-induced toxicity in vitro and in vivo. Cancer Res 55:2608–2614. (1993) Hematopoietic stem cell deficit of transplanted bone marrow previously exposed to cytotoxic agents. J Exp Hematol 21:156–162. (1995) Structure, function, and inhibition of O6-alkylguanine-DNA alkyltransferase. Prog Nucleic Acid Res Mol Biol 51:167–223. (1991) Use of antibodies to human O6-alkylguanine-DNA alkyltransferase to study the content of this protein in cells treated with O6-benzylguanine or N-methyl-N′-nitro-N-nitrosoguanidine. Carcinogenesis 12:1679–1683. (1997) O6-Methylguanine-DNA methyltransferase (MGMT) transfectants of a 1,3-bis(2-chloroethyl)-1-nitrosourea (BCNU)-sensitive colon cancer cell line selectively repopulate heterogeneous MGMT+ /MGMT− xenografts after BCNU and O6-benzylguanine plus BCNU1. Cancer Res 57:4817–4823. (1996) Activity of the DNA repair protein O6-methylguanine-DNA methyltransferase in human tumor and corresponding normal tissue. Cancer Detect Prev 20:1996. (1996) Retroviral transduction of a mutant methylguanine DNA methyltransferase gene into human CD34 cells confers resistance to O6-benzylguanine plus 1,3-bis(2-chloroethyl)-1-nitrosourea. Proc Natl Acad Sci USA 93:14088–14093. (1976) Nitrosoureas: A review of experimental antitumor activity. Cancer Treat Rep 60:665–698. (1998) O6-Methylguanine-DNA methyltransferase activity in adult glimos: Relation to patient and tumor characteristics. Cancer Res 58:1068–1073. (1983) Mechanisms of chemical mutagenesis and carcinogenesis: Effects on DNA replication of methylation at the O6-guanine position of dGTP. Carcinogenesis 4:1591. (1987) Measurement of O6-alkylguanine-DNA alkyltransferase activity in human cells and tumor tissues by restriction endonuclease inhibition. Cancer Res 47:6229–6235. (1998) Isolation of humanO6- alkylguanine-DNA alkyltransferase mutants highly resistant to inactivation by O6-benzylguanine. Cancer Res 58:1936–1945.